Erika was called and arrived at a critical point; Alex and her support team were exhausted and the institution was starting to move closer and closer to taking complete control of the birth. After months of research and excited planning for the complete unknown of the arrival of our first child, it all happened so suddenly. The gradual and relaxed ‘home stage’ that we had planned for with Erika, didn’t happen, as due to a series of complications (a week ‘late’, waters ruptured and GBS positive) Alex went in for a checkup at the Women’s and was put in ‘baby jail’. Eight hours after the induction process started, things were happening very quickly and the initial feeling that it was going to take ‘forever’ was far from our minds. Erika was called and arrived at a critical point; Alex and her support team were exhausted and the institution was starting to move closer and closer to taking complete control of the birth. There was justified concern about the health of our Ida and we are grateful to the staff at the Women’s for their attention and concern. What was really happening at the point that Erika arrived was a very, very fast transition that no one expected. 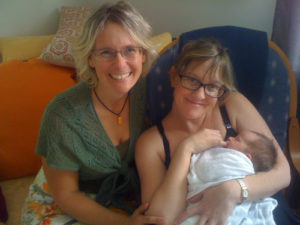 Alex went from five to 10 centimeters dilated over a 30 minute period, a period where Erika empowered Alex to take control of the birth and revived her confidence in providing life for, and birthing the baby, herself. Up until the last push there was talk of a caesarian but Alex had begun to focus only on her baby and the considered encouragement and advice from Erika. Our beautiful girl was born only 17 minutes after it was discovered that Alex had transitioned so fast. So many thanks to Erika for her timely and supportive role in the birth of Ida Grace. Seemingly against all odds, Alex was able to birth her child naturally and our beautiful daughter arrived safe and sound.